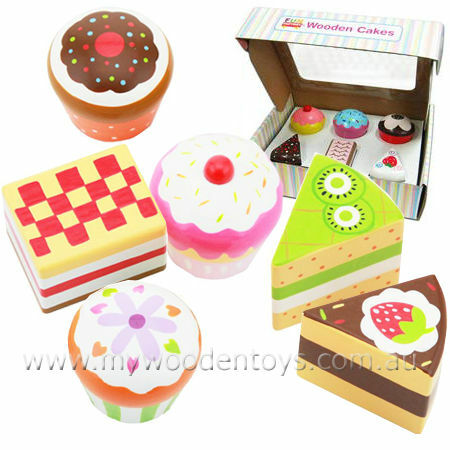 Wooden Cakes Toy Play Set is a yummy set of six wood cakes presented in a candy striped box just like the ones you find in some bakeries. The six cakes are beautifully made and individually painted in a range of colours and designs. This is a lovely toy for all those Dolly and Teddy tea times. Slices, Cup Cakes with cherries and Muffins with blue icing make sure there is plenty to choose from. A wonderful toy which encourages role play and makes you hungry. Size: The box is 22cm by 17cm by 6cm. The cup cakes are 5cm diameter by 5cm high. We like this because: "So beautifully made and presented."